VIDEO4 unit is capable of overlaying Internet Maps in real-time behind the Track Map. There are several options that are required to control this function. There are three types of qualities that the user can set. Each quality level will enhance the visibility of the image (Zoom Level) with more details but also increase the file size. For example sub road names for Road Maps will appear on the High quality version but may not appear in the low quality one. MAP Type and Quality needs to set at the properties page of Track Map object under VIDEO4 Configuration Tool. 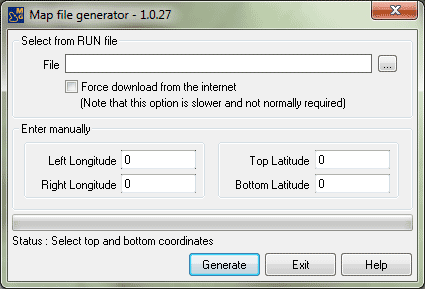 Users can create their own map files by using the provided software by Race Technology Ltd. User only needs to provide top and bottom longitude & latitude of the required map with expected MAP Types and MAP Qualities. User even can generate a single file with both Satellite and Road maps with all three qualities.